We consider ourselves very fortunate to work with the quality of clients we do. Over the last few years we’ve worked on over 30 sales transformation projects and helped to significantly increase the number of salespeople who achieve quota and helped organisations build a long-term sustainable business with a pipeline of qualified opportunities. But we still learn from each client project, including the latest – an innovative B2B enterprise software company with strong ideas about what needs to be improved in the way they sell. I have drawn up a checklist of the things every sales organisation that really wants to change must do, based on years of experience and some learnings from the last few days. This is a statement of how you want your customers and internal stakeholders to describe your sales approach. Make it clear and achievable and in the form of statements like some of those from our software client - ‘You really understand our industry and business’, ‘Conversations with you are always valuable’ or ‘You collaborate well as a team’. The process of Sales Transformation has to come from the top. In the past we always started the process with a senior management workshop. But our new software client wanted a bottom-up approach to avoid the program being perceived as “yet another global initiative”. So we workshopped the Sales Engagement Toolkit and the required Selling Skills in a cross-functional team of sales and professional service people and they made a presentation of the results to senior management. The concepts were well thought through by the people who were going to use them; they defined the implementation plan and presented it with great conviction to the senior managers who enthusiastically bought into it. So it’s not just bottom-up or top-down – you need both to achieve the very best results. Efforts to support today’s sales force must focus on driving valuable conversations with the network of people involved in buying your products and services. A sales transformation project must help every sales person to develop their personal brand. There has to be real content behind their business cards. This is not off-the-peg content. It has to be a pragmatic set of tools that focus on improving sales professionalism tailored to your business and different types of sale. Include good examples of each concept and provide self-service refreshers to reinforce learning. Sales managers are responsible for ensuring that change happens. Nothing will change if you don’t inspire and train them in advance so they are equipped to support their team. But the learning only really starts when the sales teams put the training into practice. So our clients run Deal Pit-Stops, initially with an Infoteam consultant present so the managers can get useful feedback after each session and go into the next session even better equipped. Without a planned rhythm and pace change is likely to start off fast but quickly peter out as gravity takes over. A planned and realistic schedule of implementation for salespeople and sales managers is the best approach. Try to introduce everything at once and you risk complete failure. Introduce each concept, make sure it is embedded into daily business then move on to the next concept. Our software client wants us to train the Sales Engagement Toolkit in small chunks – half day or even 2 hours sessions. This means sessions are short enough so people can really take the ideas on board and frequent enough to maintain the pace of change. Face-to-face learning is essential, but it must be based on live projects that are discussed in the team assignments. Learning on the job is vital but it needs to be supported by managers. IT options, like learning reinforcement apps, can be really useful. But none of these methods alone will deliver true change and you don’t have a chance of changing ingrained habits unless you use all 3 effectively. The ultimate outcome of a Sales Transformation will be more deals closed and a robust pipeline of qualified opportunities. But that goal can be hard for individuals to see day-to-day so you need to measure individual and team skill improvement and make sure the whole team knows when people win. The words and phrases you use for your new sales process must fit in with the terminology and culture of the organisation. This often means going round the whole organisation looking at programmes and initiatives to ensure there will be no overlap or confusion over language etc. And most important, make sure your CRM is aligned with the new way of selling. It is critical that the way you recruit and on-board new hires is aligned with your new way of selling. You have to hire the right people and train and reward them based on them doing the right things. You have to treat selling your new approach internally just like a sale to a customer. Identify all the people who are going to be affected and make a case to each of them showing how they will benefit. Clients who have done all of the above things have achieved an adoption rate of +80% and that delivers excellent tangible results. You can read much more about each of the above points in my recently published book, Customerized Selling - Learn How Customers Want You To Sell. 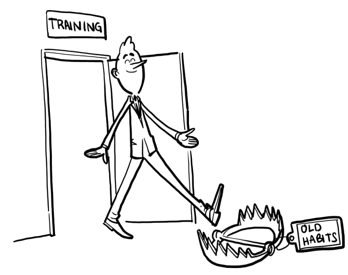 Are you expecting Sales Training alone to make a significant and sustained difference? Have you made sure everything else in the organisation is aligned to your new way of selling? Have you done a good job of selling internally?